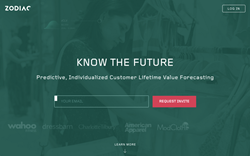 Zodiac is announcing today $3M in seed funding to launch its predictive analytics solution that accurately forecasts individual customer lifetime value (CLV). The solution replaces outdated backwards-looking methods with predictive, individualized metrics based on real-time sales data. The models were developed by Wharton School Professor Peter Fader and his team of PhD data scientists eager to empower marketers with precise acquisition and retention metrics. The seed round was led by First Round Capital, with participation by Metamorphic Ventures and others. Brands are spending millions on marketing automation, personalization and customer acquisition technologies without an accurate understanding of individual customer lifetime value. With Zodiac, these companies will be able to dramatically increase revenues and retention and put a multiplier effect on their current marketing technology investments by honing in on the most valuable customers with the right recommendations and offers. Zodiac is currently being used by American Apparel, Charlotte Tilbury, dressbarn, ModCloth, and Wahoo Fitness, among others. Its launch focus is primarily on retailers, with other market verticals to follow. To learn more, visit http://www.zodiacmetrics.com or contact: sales@zodiacmetrics.com. "Zodiac gives me the power to segment customers by predictive CLV, which is a better way to optimize my marketing spend and drive deeper customer engagement." Founded in 2015 by Dr. Peter Fader, Artem Mariychin, Justin Bleich, and Daniel McCarthy, Zodiac adapts decades of research into customer lifetime value developed and refined by Fader at the Wharton School of the University of Pennsylvania (in collaboration with Bruce Hardie of the London Business School and other colleagues around the world). Its cloud-based platform tells marketers which customers will purchase again, how much they will spend, and which are going to churn—all based on raw sales data. Zodiac uses probabilistic models to accurately predict customer behavior and deliver instant, individualized CLV forecasts. The goal is to enable marketers to use these metrics in current marketing tools to help optimize campaigns to acquire and retain higher value customers and grow their business. For more information, visit: http://www.zodiacmetrics.com. First Round is a seed-stage venture firm focused on building a vibrant community of technology entrepreneurs and companies, including Uber, Square and Warby Parker. Through custom-built software, incredible in-person experiences, and a host of other unique services, First Round helps tiny companies get big while constantly reimagining the role of venture capital.